Following in the Jesuit tradition and with a commitment to the development of the whole person, St. Ignatius Parish School provides an excellent religious and academic program. Catholic faith and values are integrated into the life and culture of the community and support the spiritual, emotional, and social development of each student. Students are guided to become active Catholics with self-respect, respect for others, and a reverence for all of God’s creation. There is comprehensive religion curriculum in Preschool through eighth grade. Each week begins with shared prayer at the Monday morning assembly. The children attend Mass with their class once a week. Each class participates in a special school liturgy attended by all of the students and many members of the parent community. Preparation for the reception of the sacraments is part of the curriculum in the second grade (Reconciliation and First Eucharist) and the eighth grade (Confirmation). Students have the opportunity to participate in the celebration of Mass as lectors, ministers of hospitality, choir members, and altar servers. 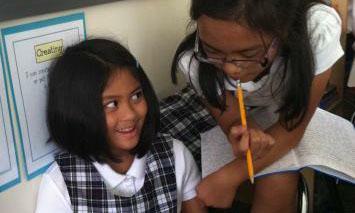 The curriculum at St. Ignatius Parish School is traditional while dynamic. Utilizing the finest current methods and materials, the staff focuses on the basics, giving each child the foundation for a lifetime of limitless learning. And our graduates succeed as they go on in the pursuit of this learning at the high school and university level. Our qualified and effective staff is dedicated to the program and boasts an average tenure exceeding ten years. New materials are adopted on a rotation that coincides with the state’s schedule to insure access to the most current resources. The math program progresses incrementally from Preschool through the eighth grade. Algebra is offered for those eighth grade students who demonstrate a proclivity for math. The language arts curriculum moves through phonics, reading, literature, spelling, and vocabulary. Creative writing is stressed at each level. Grammar is a strain that weaves through each grade in a very traditional and structured manner. In the area of social studies, the students look at the structure of communities, history, geography, civics, and current events. The students in grades one through eight have a science teacher and the curriculum stresses scientific observation, experimentation, and classification. TK through eighth grade learn technological fluency in the computer lab. They also use the lab to work on special projects in all areas of the curriculum. Classes one through eight participate in Spanish class twice each week. In art class the students in first through eighth grade learn to express their ideas using various artistic techniques, and they learn to critique art with an educated eye. This is an integral part of the development of each child, and the programs at St. Ignatius Parish School reflect this belief as it is expressed in the Mission Statement. The physical education classes for TK through eighth grade stress positive interaction, competition with respect, discipline in games with rules, and the self-discipline necessary in free-play. In honor of Mrs. MacDonald’s service to our school and community, the Carla MacDonald Scholarship was created. This Annual $1,000 scholarship is awarded to a current 8th grade student. The criteria for this scholarship was established based on all the virtues that Mrs. MacDonald blessed our school community with.